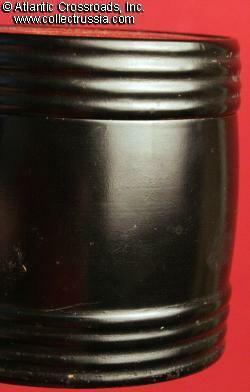 Fedoskino Summer Troika lacquer "keg" from the Vishnyakov and Sons Workshop, circa early 1880s. 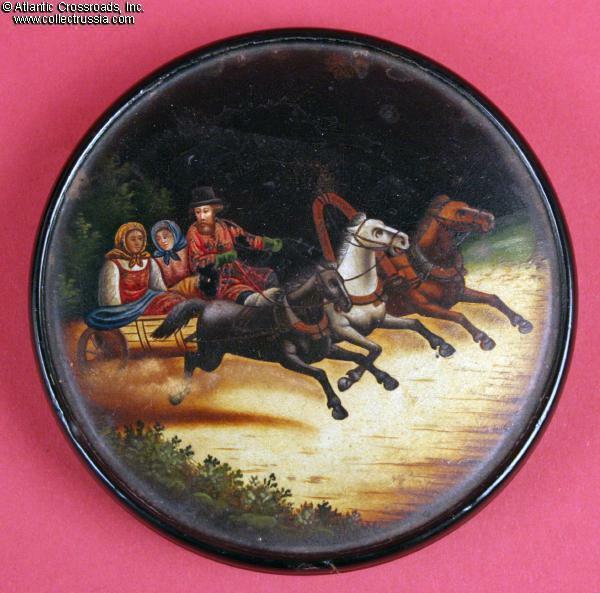 Fedoskino Summer Troika lacquer "keg" from the Vishnyakov and Sons Workshop, circa early 1880s. Designed for use as a caddy for either tea or tobacco. 3 ½ " in dimeter, 3 5/8" high. 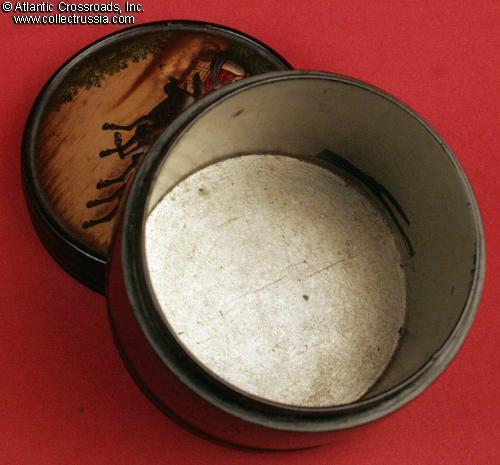 Interior lined with a metallic coating designed to preserve the tea or tobacco held inside. 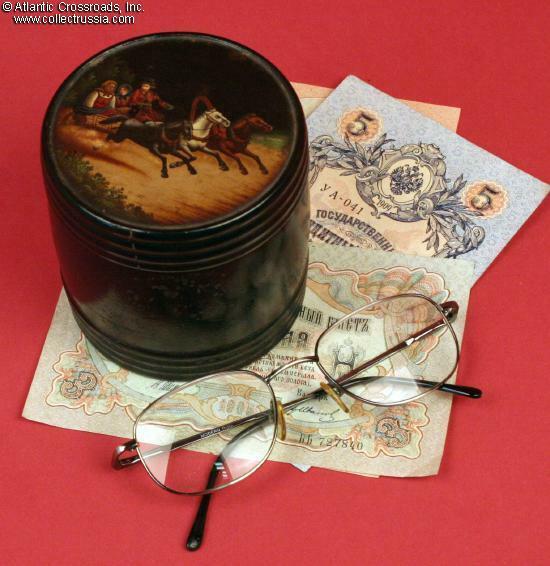 Trademark is Vishnyakov imperial crown pattern that featured two award medals showing Tsars Alexander II and Alexander III. Very good to excellent condition. Some light surface blistering one side only, possibly due to the keg having been placed on a tabletop too close to a pouring teapot. 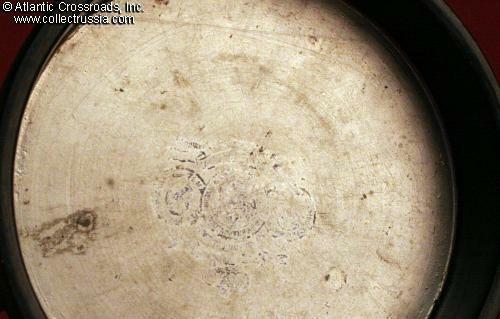 Scratch on the outside lip of the lid does not impact the artwork (and could probably carefully colored in if desired). 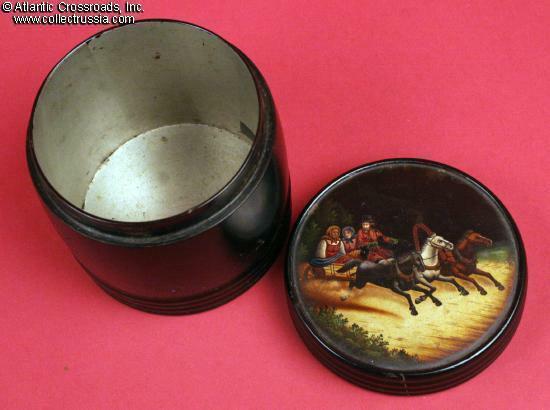 The painting is delightfully bright; most lacquerware surviving from this era has darkened. The "tinned" surfaces on the inside are still bright and clean. Most of the trademark inside of the lid has disappeared due to repeated cleanings. There is enough of the trademark left to recognize the outlines of three award medals arranged under the Imperial Russian crown. 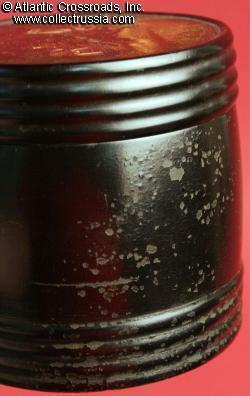 The style of the mark, coupled with the overall design of the container and the execution of the artwork indicate that this keg was made by the Vishnyakov and Sons Workshop, circa early 1880s. 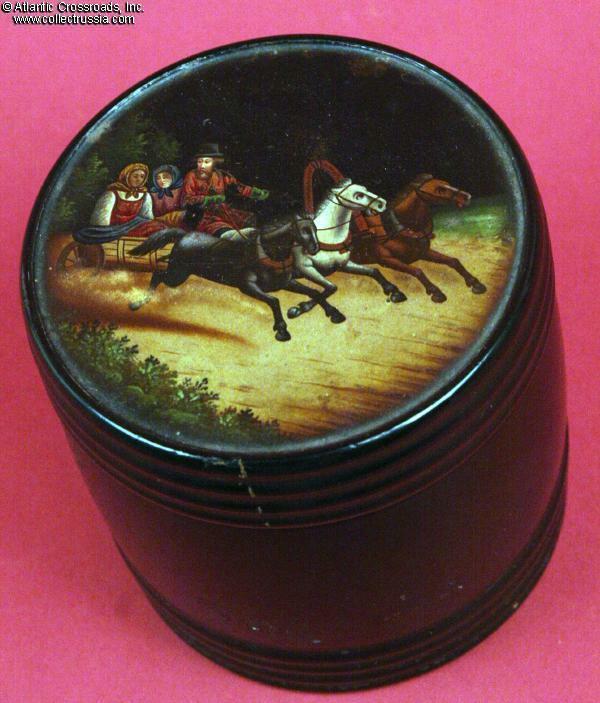 As we have commented before, next to generic peasant scenes, views of troikas were probably the most popular images to appear on pre-Revolutionary lacquerware - both on items for export and for domestic consumption!